This is an English locational surname. It originates from a new "lost" village which was formerly situated between Marple and Macclesfield in Cheshire. The name is medieval and illustrates the formerly semi-mobile nature of villages in that in response to plague, economics, or war, the inhabitants would be scattered to the four winds. This is proved by the many and varied spellings of complicated names,in this case there are (at least) six spellings, Higginbottom, Higginbotham, Hickingbotham, Hickinbottom, Hickenbotham and Higgenbotam, all different from the original recording. The name means "the dweller at Hygg's (a nickname for Richard) Land in the valley base. 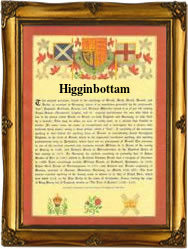 The first recorded spelling of the family name is shown to be that of John Hyggynbothom. which was dated 1563, in the Parish records, Prestbury, Cheshire. during the reign of Queen Elizabeth 1, known as Good Queen Bess, 1558 - 1603. Surnames became necessary when governments introduced personal taxation. In England this was known as Poll Tax. Throughout the centuries, surnames in every country have continued to "develop" often leading to astonishing variants of the original spelling.